Magic Mirror: The Astounding, Magical Photo Booth... Rent it Today for an Enchanted Event! The Magic Mirror Photo Booth from Kealoha Events takes photo booth fun to a whole new level and offers unparalleled class to your occasion. Magic Mirror is a unique photo-generating product offering the latest technology in interactive picture taking. The full-length mirror offers a sleek design and a user-friendly interface, communicating with guests through a touch screen of colorful animations and entertaining voice guidance. Magic Mirror is perfect for every occasion! Whether you're planning your big "I do" or just want an extra special birthday celebration, your guests will love the top-of-the-line Magic Mirror Photo Booth. What can Magic Mirror do? The Magic Mirror is the most advanced photo booth Kealoha Events offers. Check out some of the notable features below and watch a video demonstration. Book the Magic Mirror for your next event today! The Magic Mirror Booth comes with 200+ premium animations to choose from. Each and every animation has been especially created to offer bright and colorful graphics that will engage your guests. These animations are ready-to-use, tailored to specific events and even offered in a variety of different languages. All animations include professionally recorded voice-overs. Multi-Presets Selection Screen allows the user to choose from several different templates, print layouts, languages, and their desired background. These options are displayed by a thumbnail image of their photo layout. This feature is extremely simple to implement and keeps things fresh so your guests can enjoy a dynamic experience! By simply tapping on the screen to choose, guests have the ability to control their user experience. One of the most exciting features of the Magic Mirror Photo Booth is the built-in Signing & Stamping Feature. Guests love having the ability to personalize their keepsake with this unique and interactive feature. When the Signature feature is used in a workflow, guests have the ability to draw or sign their name directly on the mirror, which will then be printed out on the final image. The mirror includes a built-in email sharing option. You can share multiple photographs, animated GIF files and full videos (with audio) generated by the mirror. Social media integration is also made accessible via a third-party software. The Magic Mirror Photo Booth uses a hot spot connection to wirelessly send photographs, GIFs and videos. The LED Ring is a brilliant add-on that emits a mesmerizing, animated light from within the mirror. The accessory naturally guides the user to look directly into the camera lens as it captures the photo. You can easily customize the pattern of light animation (transition of circles, point accumulation or single point transition), the speed of the pattern and even the color of the lights. With the ability to save GIFs & videos from the Magic Mirror Photo Booth software, you can turn the photo-taking experience into more than just a photo keepsake! While the digital camera captures the photos, the software transforms these photos into a GIF or a video file which can easily be sent to your email or shared to your social channels. Can you recall those candid shots of you screaming as you ride down a terrifying roller-coaster? The Magic Mirror’s engaging scream feature captures the same idea by inviting users to reach the highest level of the scream bar as their photo is being taken. These results can be visually presented on the final photo with the achieved score as well. You read it right! Magic Mirror lets users play social games directly on the mirror. You get full control over game-integration in the workflow, combining gaming and selfie photography for a mind-blowing experience. Play Tic-Tac-Toe, Pong, and more. We are always working on new games & apps that will be included for users! The Magic Mirror Photo Booth is a versatile photo booth. With the ability to create video and audio recordings, guests can use this feature as a way to record a message at a wedding or simply to record a funny video clip with friends. Videos recording is supported via the integrated DSLR camera, via a webcam or the integrated Kinect sensor. The Green Screen feature lets your guests position themselves anywhere in the world with a simple green screen backdrop. This feature uses precise and accurate chroma keying to provide guests with the ultimate experience in special effects. Offer your guests different backgrounds to choose from or use a standard one throughout the Workflow. Magic Mirror allows you to use triggers to move from one state to the next. The software works with Kinect for XBox One to detect the user’s gestures. Magic Mirror can detect when a person has entered the area and begin the sequence. Movements are detected through basic gestures, like raising both hands above your head or smiling. Magic Mirror’s animations attract a wide array of populations with different language options to choose from. The Magic Mirror Photo Booth visual animations are offered in Chinese, Czech, Dutch, English, German, Hebrew, Hungarian, Portuguese, Russian, Spanish and many more. 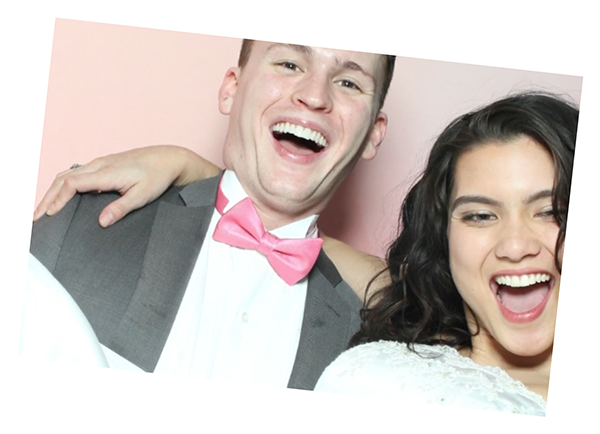 Watch as this cute bride and groom explore all the features of the Magic Mirror Photo Booth! They will take you on a complete tutorial of all the booth's incredible features like photo retakes, photo signing & stamping (including emojis), fun animations, photo emailing, photo printing, and more! Let Kealoha Events & the Magic Mirror Photo Booth be part of your special day! Get more with Magic Mirror & discount event packages! Book our Magic Mirror today and save $200! This special packages includes everything you need: Magic Mirror, printer, props, attendant, and more!